With its distinctive 'bat ears' the French Bulldog is muscular and sturdy. French Bulldogs have pug noses and square flat heads. French Bulldogs originated in France. French Bulldogs are about 12 inches (30cm). French Bulldogs weigh 19 to 22 pounds (9 to 10kg) or 22 to 28 pounds (10 to 13kg). French Bulldogs come in brindle, fawn, white and combinations of brindle or fawn with white. The skin is soft and fairly loose. An average shedder, French Bulldogs require only weekly brushings. Patient and sweet, French Bulldogs crave companionship and do not do well on its own. French Bulldogs do not bark without cause. They may become very possessive and protective of their owners. French Bulldogs will hunt mice, and make excellent companions for the elderly. French Bulldogs may drool or slobber. If they get overweight, French Bulldogs will have respiratory problems and may be gassy and wheezy. French Bulldogs can be expected to live 10 to 12 years. French Bulldogs cannot swim and must therefore be careful around pools and open water. This breed does well in apartments and prefers cooler weather due to its susceptibility to heat stroke. French Bulldogs belong to the Non-Sporting Group. The French Bulldog, otherwise known as the Frenchie or even the clown, is a small and active companion dog. His happy-go-lucky temperament and gentleness makes him a joyful family member who craves contact with his human family. Wondering where you’ve heard of this breed? If you’re a fan of Jonathan Kellerman’s Alex Delaware novels, you’ll remember that Robin and Alex lived with Spike and with Blanche, both French Bulldogs. Martha Stewart and Reese Witherspoon both have these dogs in their homes, as does Olympic snowboarder Shaun White. The breed was featured in the movies Transformers II and Just Married. What does a French Bulldog look like? The French Bulldog is small, but solid and muscular. They range in weight from 20 – 28 pounds and stand about 12 inches. They have a short, smooth coat that may be brindle, fawn, white, or brindle and white. Other colors are acceptable in the conformation ring except for solid black, mouse grey, liver, black and tan, and black and white. The soft, loose skin around the head and neck forms wrinkles, but the quickest way to identify a Frenchie is by his or her ears. They stand up straight and have round tops and broad bottoms. They are often described as bat ears. Their large heads can cause problems. The top-heavy head makes it very difficult, if not impossible, for the Frenchie to swim, and he should never be around a pool or natural body of water unsupervised. Also, the large head means that many Frenchie mamas must deliver their pups by Caesarian section. Is the Frenchie a good family dog? The French Bulldog is energetic and may be too much for small children. These dogs often become jealous of the children and other pets in the home, and must be carefully socialized. They often become attached to just one person, and may become aggressive to everyone else. Male French Bulldogs may be especially averse to other males. Due to their small size, Frenchies are equally at home in a large house or a small apartment. They have a short, single-layer coat that sheds minimally. They will bark at strangers, but don’t carry on excessively as some other small breeds might. Heavy-duty exercise is not required, but Frenchies do need a daily walk to release some energy and to keep their weight under control. This breed is notoriously stubborn and hard to train, both for obedience and for housebreaking. You should expect to crate train a French Bulldog puppy for at least 4 – 6 months if you value your carpets. Does the flat face of a Frenchie cause health problems? 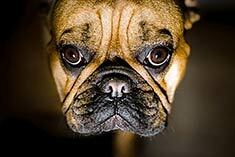 As with any brachycephalic dog, the French Bulldog can experience many health problems related to his mushed-in face. Their compacted airway makes it difficult for them to regulate their body temperature, meaning that they cannot be left outside in hot or humid weather and must always have access to fresh water, shade, and a cool environment. The short snout also means that your Frenchie will likely snore and often regurgitate his food. Regurgitation, as well as flatulence, is common because these dogs swallow a lot of air with their food. Wheat-based foods may worsen the flatulence problem. Due to their compromised respiratory system, French Bulldogs are very susceptible to breathing difficulties, which are made worse by tobacco smoke, cleaning chemicals, pollen, and freshly-cut grass. You must be sure to keep your dog away while cleaning or mowing the lawn, until all of the particulates are out of the air. Take the time to find a veterinarian who is well-versed in brachycephalic breeds. They need to use modern anesthetics and monitor the heart and blood pressure during surgeries to minimize the risk of the dog suffocating on the surgical table. When you walk a French Bulldog, use a harness that wraps around the chest, rather than a traditional collar that could compress the windpipe. Are there other health problems common in the French Bulldog? Health problems range from minimal to life-threatening. For example, it is not uncommon for food and other debris to become stuck in the dog’s face wrinkles which can cause irritation and even infection if the wrinkles are not carefully cleaned out after meals. Eye problems such as glaucoma, corneal ulcers, juvenile cataracts and cherry eye are seen in French Bulldogs. When you are considering purchasing a Frenchie puppy, be sure to check to see if the parents have been screened by the Canine Eye Registration Foundation. Cleaning the skin folds under the eyes and keeping them dry can also help to avoid infections. Malformations in the dog’s gastrointestinal tract can also cause problems. One of the most common problems seen in Frenchies is a cleft palate, where the two sides of the mouth do not join properly to form the roof of the mouth. These puppies must generally be put down, as there is no way to treat the condition and feeding becomes impossible. Alternatively, the soft palate may be elongated and interfere with breathing. This may be mild or severe, causing the dog to lapse into unconsciousness during mild to moderate exercise. When the esophagus is malformed, the dog often regurgitates his food soon after eating or during exercise. If the regurgitated food is aspirated into the lungs, pneumonia may be the result. Another congenital disease to which Frenchies are susceptible is Von Willebrand’s disease. This disease is similar to hemophilia and makes it tough for the dog’s blood to clot following an injury. Thyroid dysfunction is also relatively common and may result in a variety of skin conditions and contribute to reproductive issues by causing the female to have “silent” or undetectable heat cycles. 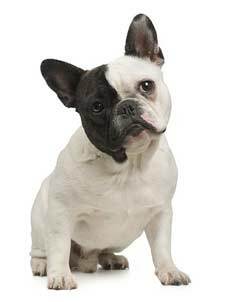 Before breeding, all French Bulldogs should be tested for both Von Willebrand’s disease and thyroid function. Is the French Bulldog the breed for me? This breed is particularly popular among apartment dwellers due to their small size, and moderate exercise needs. They are ideal for single adults, where there is no one else in the home to inspire jealousy. They don’t bark excessively, and are playful, although care must be taken to avoid overheating. If you are looking for a dog to accompany you on your outdoor summer activities, or if you want a dog who is easy to train, you may want to look elsewhere. Also, if snoring, snuffling, snorting, and bowel gas annoy you, this is definitely a breed you will want to avoid. Find French Bulldog Puppies with our Free Breeder search!